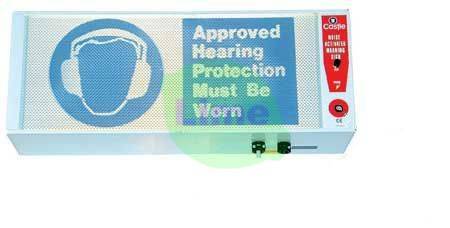 The GA902 Noise Warning Sign activates only when the noise exceeds a pre-set level allowing exposed workers to wear ear defenders only when absolutely necessary. Being of rugged construction, the GA902 is suitable for most industrial situations. It is also available in Stainless Steel for the food and pharmaceutical industry. Noise warning text is generally supplied to EC requirements, but alternative graphic and languages are available to order. Fitting the optional Remote-Beacon greatly increases the noise warning impact, especially in large areas. The GA902 Noise Activated Warning Sign is a self-contained unit housing its electronics in a tough case and is easily installed and set up. The front panel noise warning text is available as standard in EC or USA forms, but can be ordered in any language and a variety of colours. The front panel is completely blank when idle but brilliantly lit when activated to give an easily noticed noise warning. Outputs from the master unit can also trigger other external devices such as machines or process cut-off actuators. The GA902 Noise Warning Sign can easily be made into a system with the addition of slave units which are powered from the master. Two masters can also be linked to work together. These features can greatly extend the scope of your system whilst keeping the number of units to a minimum. A remote microphone (optional extra at additional cost or see GA902R) enables the sign itself to be in a prominent position while the microphone can be placed closer to a major noise source. Delivery usually within 3 working days.